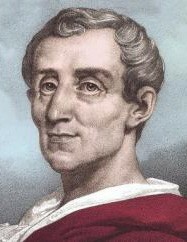 Montesquieu was born in his hometown Boredeaux, France in 1689. Although he started out placed in poor family, he later inherited fortune and the name Baron De Montesquieu when his uncle died. He first gained fame in 1721 by his writing Persian Letters but became most famous when he wrote The Spirits of Laws . He later died in 1755 in Boredeaux, France. "Useless laws weaken the necessary laws." This quote explains if a law has no use to it how having that extra law would drag down the others down. "To become truly great, one has to stand with the people, not above them." This quote shows that if you are truly great, you are in it for the common good of the people, not to have power to yourself. "If triangles had a god, they would give him three sides." This shows that a government is only as good as it's people or what the people do. "An empire founded by war has to maintain itself by war." This shows if you use voilence for something you have to keep useing it for it stay the same. "There is no crueler tyranny than that which is perpetuated under the shield of law and in the name of justice." The quote shows how cruel it is to the people when a leader can do things that are wrong and not be punished because the law supposedly said the they can do so. Montesquieu is a French philosopher who lived in the 17th and 18th century, also known as the age of Enlightment. He is most known for his work on The Spirits of the Laws, where most of his best philosopher ideas were drawn from. 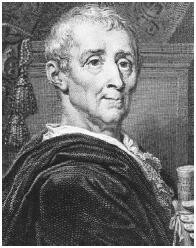 Born in 1689 Montesquieu died in 1755 by a fever. He had a lot of ideas that influenced the constitution. Two of his ideas that can be found in the constitution are seperation of powers and checks and balances. Seperation of power is the idea of three brances (excutive, judicial, legislative ) that share power to make it equal. Checks and balances is the idea that each branch has a way to lessen power so no one is superior .